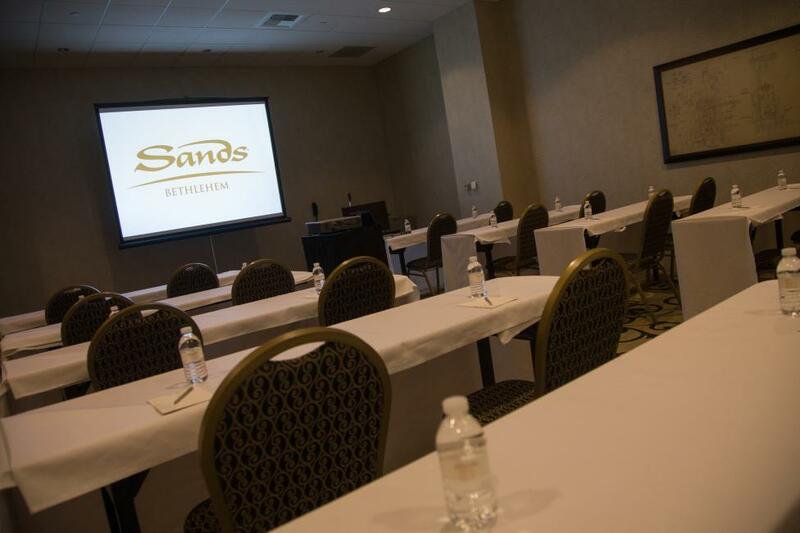 SandsⓇ Bethlehem is an action-packed destination for your next event. This full-service property offers 282 luxurious guest rooms, upscale dining options by Emeril Lagasse and Buddy Valastro, nightlife featuring the hottest acts around, and some of the best-known brands in the Outlet shops. The gaming options include 200 tables games, stadium gaming, and slot machines ranging from a penny to $100 pulls. With 12,000 sq. feet of meeting space and 14,000 sq. feet of trade show floor, this location is sure to fit your needs. And with the Sands ECO360 Global Sustainability program, you will ensure that you are minimizing the effects on the environment. You’ll overlook the iconic blast furnaces of the former Bethlehem Steel company from the windows of the Foundry Room. This 2,430 sq. foot room is large enough to host a larger executive retreat of up to 45 people in a U-shape setting. Take a stretch break by walking the Hoover Mason Trestle to get the bird’s eye view of the blast furnaces? It is located just adjacent to the parking lot, stands 46 feet above ground-level and is 2,000 feet long. Make sure to bring your camera! From the catering staff to the sales professionals, the SandsⓇ Bethlehem team offers years of hospitality experience to make sure your event is executed with professionalism in mind. Customized team building activities can be created to help with your company’s challenges. Before you leave, be sure to stop at the famous Carlo’s Bakery. Tip: the Lobster Tail is a must-try! This lobster-shaped, flaky Italian pastry stuffed with a whipped cream mixture will have your taste buds longing for your next visit! Bear Creek Mountain Resort in Macungie is the perfect spot for your next board retreat. This year-round resort is located on 330 wooded acres offering ultimate wintertime fun on the ski slopes, adventurous hiking in the fall, and outdoor heated swimming any time of the year. Your guests will find tranquility in the Fireside Suite which accommodates up to 30. As the name suggests, there is a fireplace in this meeting space along with a walkout balcony and floor-to-ceiling windows that give you the best view of the mountainside. The room is also equipped with state-of-the-art audio visual needs. Add a little excitement to your retreat by enhancing your Monday through Thursday meeting with a 2-hour Fire Pit Wind Down ($150 for 15, plus $10 for each additional person) where you’ll make s’mores and have some quality bonding time in a relaxed environment. If the weather’s not on your side, you can always challenge your team on a 2-hour indoor Photo Scavenger Hunt ($150 for 2 hours, $75/hour for each additional hour). This meeting enhancement will pull the team together by giving them clues where they will have to take photographs with specific items. They’ll be judged on creativity and the number of items they found and photographed. There are plenty of other options to choose from that are led with certified team building instructors. You can opt for lawn games, geocaching, disc golf, mixology competitions, a marshmallow challenge, cardboard regatta, paint and sip, or just visit a nearby brewery such as Funk Brewing in Emmaus for a tasting and tour. Make sure to end your event with one of the signature cocktails and a delightful dinner in The Grille. Be sure to try the Bourbon Bear Trap (a mix of Wild Turkey 101, Wild Turkey American Honey, bitter, sage, apple, and ginger ale) paired with their Spicy Vegetarian Kung Pao Spaghetti (tofu, peppers, onions, peanuts, hot red chili, green onions, and soy chili garlic sauce).